All rates include bed linen & towels, electricity, end of rental cleaning and logs for the fire. Tourist tax is added automatically to the booking fees. Set in the heart of the largest linked ski area in Europe, Fleurs des Montagnes is a detached chalet and therefore unlike an apartment you won't be disturbed by people above, below or either side of you. It is situated at the front of the sought after Les Coprins chalets and enjoys uninterrupted breathtaking views often used for postcards of the village. We are only 100m from a chairlift taking you to 650km of marked runs, or you can catch the free 'navette' which stops near the bottom of the drive to the other lifts, which are only minutes away. The nearest lift will also take you into some wonderful mountain walking paths, if skiing is not for you. Chatel has an enviable snow record due to its northern slopes and a heavy investment in snow cannon, and even in the poor 2016/2017 season, visitors reportedly only lost 5 days due to poor weather. This beautiful chalet is built on 3 floors including a large lounge/dining area with an extensive south facing terrace and separate designer kitchen, all with uninterrupted wonderful views. We have 4 bedrooms, sleeping 8 people in permanent beds, plus room for a baby in a cot. There are 2 x double bedrooms (one with a large double bed and one with a standard), one twin room and one with adult sized bunk beds. Bedrooms are located on the ground and 2nd floors with bath/shower rooms and toilets on each. Rates include local tourist tax, electricity, linen, logs and cleaning. There is a well equipped kitchen with oven, microwave and dishwasher, dining and lounge seating and a very efficient drying/boot room. Switzerland is minutes away by car, or ski using the chair lift 100m from chalet, which will also take you into the linked area. Navette bus takes you to other lifts every 20 minutes from 8.15am to late evening. 40 runs immediately surrounding Chatel- 5 black, 17 reds, 12 blues 6 greens and 27 snow cannons. Garage and further car parking space available. Summer details: Being south facing the chalet receives above average sunshine. There are a vast selection of summer activities including 200 km of marked footpaths and cycle trails in Portes du Soleil, swimming pools, horse riding, angling, tennis and a year round toboggan run- all available in Chatel. Lake Geneva will all its water sports activities is just a 40 min drive and there are plenty of river sports such as white water rafting, kayaking, canyoning etc. 20 mins away in the Abondance valley. We bought the chalet as we wanted somewhere we could have holidays with our children when they would normally not want to holiday with their parents; skiing in the winter and hiking in the summer was a perfect solution (and it worked!). We chose Chatel as it is still a working mountain village and not solely focused on winter sports. The local farmers still make wonderful cheese and other produce which mean the sounds of cowbells in the summer! The chalet is light and airy, with amazing elevated views around the valley and being south facing, lots of sunshine! Both bathrooms have been replaced recently using quality fittings (Hansgrohe). A welcome pack is provided for week long renters so you can enjoy a bottle of red wine, coffee, tea or hot chocolate before you head to the supermarket! Washing machine in drying room Shelving units in both bathrooms to store washing bags etc. Laundry basket in bathroom. Drying room (not tumble dryer) including boot store, which is highly effective and will dry ski jackets, boots etc. etc. in no time at all. LED HD television with bluetooth enabled sound bar for iphones etc. Chalet gwych yn Châtel. Golygfeydd hyfryd o'r balconi. Lifft sgïo yn agos iawn i'r chalet ond ddim yn addas i ddechreuwyr felly rhaid dal bws (am ddim) i gyrraedd lifft sy'n addas. Odd ein grŵp ni yn 5 oedolyn - bydde hi bach yn dynn i 7 fel sy'n cal ei hysbysebu. Ond ar y cyfan, lle ffantastig - Diolch. Diolch i chi am eich geiriau caredig ac rwy'n falch eich bod wedi mwynhau eich gwyliau yn ein chalet. Mae gennym 2 ystafell wely ddwbl a 2 ystafell wely ddwbl, felly Rwy'n synnu nad ydych yn credu ei fod yn ddigon mawr ar gyfer 7 o oedolion, o gofio y gallwn yn hawdd darparu, ac yn wir yn aml yn cael y rhif hwnnw pan fyddwn yn defnyddio ein hunain! No idea if this makes any sense as used google translate! Wonderful self-catered chalet with great views! Such a fabulous self-catered chalet. We went with another couple in January and had a truly wonderful holiday, to a great deal due to the chalet as the snow and weather partially let us down! We usually try to go for ski-in-ski-out and were initially a bit worried about distance from pistes, but to be honest, almost nowhere in Chatel has direct access as the best skiing is at the end of the valley away from the main village, which was incredibly easily served by a very regular free shuttle that goes from almost outside the chalet. We had a car anyway and parking was not an issue on the days we decided to drive to the pistes. We were rather surprised by how easy logistics were to be honest! We enjoyed the short 15 min stroll down the road into town for dinner one night. Owner and agent both very responsive, and it felt rather luxurious compared to most self-catered places we have stayed - high quality matching linen, beds made up, lovely welcome pack, and we loved that the kitchen comes stocked with all the basics for cooking like olive oil, salt, stock cubes, herbs etc. The chalet in general did a great job of balancing neutral and stylish, good quality decor with rustic authenticity - we ski multiple times every year, have done for many years, and find many chalets are either too modern and cold-feeling, or too cluttered, especially in France. Especially given the very reasonable price, the absolutely stunning views (we wrapped up for beers on the balcony most evenings), very comfortable beds and wonderful log fire really made our trip one of our best yet. Will definitely return next season! ALL PRICES INCLUDE ELECTRICITY, BED LINEN, END OF RENTAL CLEANING, TOURIST TAX AND LOGS. 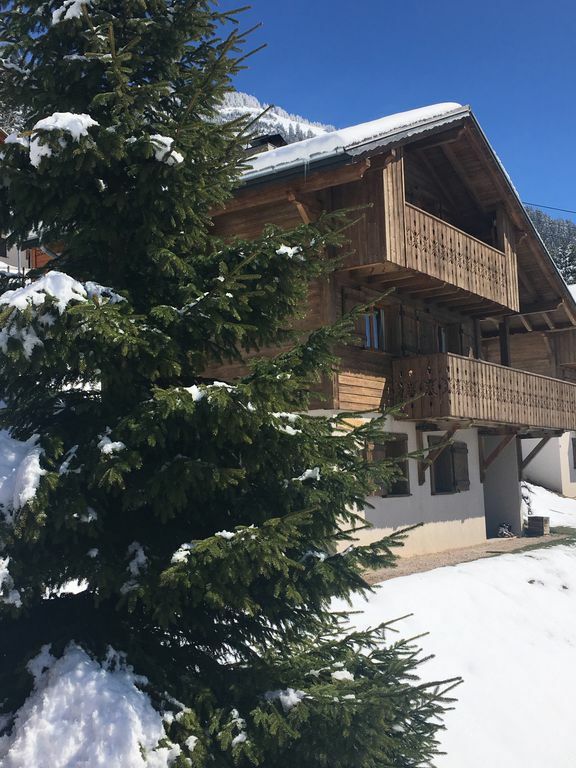 Set in the heart of the Portes du Soleil and minutes from the village centre, Les Fleurs des Montagnes is a detached chalet enjoying stunning mountain views from its' terraces and is perfectly located for both winter and summer holidays. The Portes du Soleil comprises 650 km of linked ski runs, which cross the border into Switzerland, yet is only a 40 minute drive from Evian on the banks of Lake Geneva, with its casino, beaches and spa. Ski: The chalet is situated a short walk from the nearest lift with the free bus stopping near the bottom of the drive to take you to others. Beginners and experienced skiers/boarders are well catered for with great skiing available for everyone until late April/early May.